Please refer to our stock # JC0031 when inquiring. 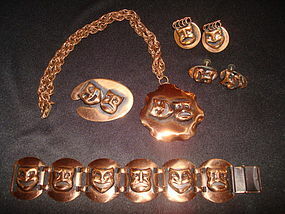 Super 1950's 4 piece set plus bonus pair of earrings featuring the famous Comedy and Tragedy motif. This wonderful copper jewelry collection consist of a Bracelet that is 7" in length and 1 1/4" wide, a Brooch measuring 2" in length x 1 3/8" wide, a Medallion 2" X 2" on a 19" chain and matching earrings that are 1" in length. Also includes another pair of comedy and tragedy earrings with spiral wire hair. All are in fine condition and solid copper!!! A STUNNING SET !! !